Frekhtman & Associates are New York burn injury lawyers that victims of fires and other burn injuries can turn to in their time of need. 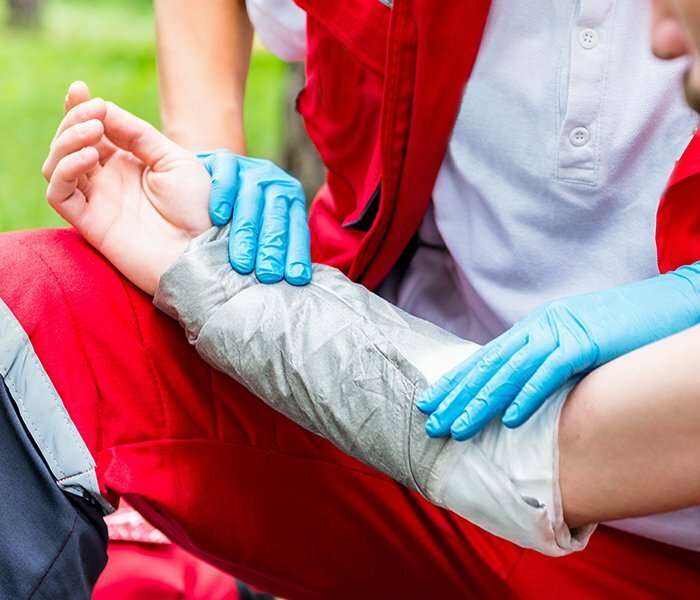 A burn injury may occur due many different types of accidents. Flames, heat, steam, radiation, and chemical burns can all produce severe burn injuries. Victims of burn injury may suffer nerve damage, dehydration, infection, organ failure, and other serious medical issues. Frekhtman & Associates will work with top experts to fully investigate how your accident happened to determine if anyone was negligent and can be held legally responsible for your burn injury. In that regard, we work closely with fire & safety engineering experts, economists, dermatologists, plastic surgeons, and other specialists. If we accept your case, our firm works overtime to build the most powerful legal case possible solidifying liability against the defendants and proving the maximum possible damages case before a jury. Many new York City burn injury accidents are preventable because they happen due to negligence on behalf of a vehicle owner or operator, a building owner or management, or other responsible party. New York law states that a reasonable party must use ordinary care in maintaining a vehicle or property so as to not result in a fire or burn injury. Too often an owner may not act reasonably and display ordinary care in maintaining their property thus leading to a fire and burn injury. Chemical burns caused by contact with chemicals including battery acid, oils, and gases. Inhalation burns caused by inhaling or breathing in chemicals or other dangerous or toxic substances which can cause severe lung damage. Ultraviolet burns may happen due to tanning booths. Contact burns happen when an individual touches an extremely hot surface such as an uncovered steam pipe, hot metal, glass, or other surface. Electrical burns occur when a person suffers electric shock from a faulty outlet or similar problem. Toxic or hazardous chemicals may cause fires, explosions, and severe burn injuries at work or at home. Whenever products are not labelled correctly, given a misleading warning, placed in an improper container, or when products are used improperly, they can cause chemical burns. Most chemical burns affect the eyes, face, hands, arms, and legs. Chemical burns can cause skin tissue damage, conscious pain and suffering, severe infections, skin grafts, debridement surgeries, seizures, and cardiac arrest. Everyday products used in a home can cause chemical burns: detergent, bleach, mix for concrete, drain cleaners, cleaners for toilet bowls or bathrooms, pool chlorinators, and household products containing lye. The majority of chemical burns occur at work in industrial locales where chemicals are manufactured or during the cleaning process where chemicals are often utilized. Explosions particularly those that happen on industrial worksites are often caused by some sort of negligence. Negligence is the failure to use reasonable or ordinary care in maintaining a work site, handling flammable liquids, or taking other fire safety & prevention precautions. Transportation of flammable liquids such as oil, gas, or other fuels. A punctured, leaking, or defective gas tank in any motor vehicle such as a truck, bus, or car can cause an explosion; Car fires lead to explosions following an accident especially when leaking fuel may ignite. The skin is the largest organ in the human body and provides a protective barrier from foreign substances that can cause infections. The skin helps regulate body temperature. When a severe burn injury due to a fire accident, chemical burn, explosion, or other similar cause happens, the damages skin cannot heal fully because the burned skin has to be replaced with healthy skin. A surgical procedure employed by physicians is called a skin graft surgery. Medically there is a strong preference to take donor skin from the injured person since his or her body is much more likely to accept skin from other parts of the body as opposed to skin from a different individual altogether. Pinch grafts: usually take a “pinch” or small piece of skin from a new site and transplant it onto the injured area. This type of surgical procedure is often used in parts of the body having poor blood circulation. Split thickness grafts transplant the outer layer of skin together with deep skin or inner layers. Full thickness grafts transfer all skin layers together with accompanying blood vessels in the area. This type of graft is frequently used by surgeons for weight bearing portions of the body such as burns to the soles of the feet. The most serious type of graft, a full thickness skin graft, may also be used for severe burns involving the dermis or deep tissue areas of the inner skin. Donor sites used by surgeons for full thickness grafting may include the stomach wall or a piece of skin from the back or hip area. Pedicle grafts are used to treat injuries to the face or hands. When performing a pedicle graft, doctors do not remove all the skin from the donor site but rather leave a small flap to confirm strong blood supply and circulation. The removed portion will assist with healing the burn injury in the new transplanted location of the body. An autograft is when a doctor transplants skin from another portion of the same patient’s body. An allograft is when skin from a different patient or source is transplanted onto the burn victim. 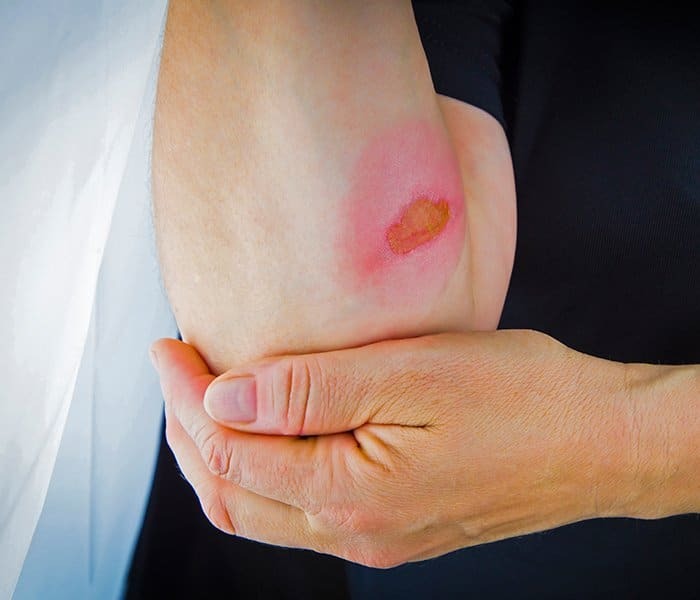 Burn injuries frequently lead to scarring which can be improved through surgical procedures such as skin grafting or debridement but often cannot be completely cured. Leaving a victim of a burn injury with a permanent scar is devastating and leads to post traumatic psychological injuries including emotional distress and depression. Human skin is made up of layers. A thick layer of skin is the dermis followed by an exterior layer of skin known as the epidermis. Burn injuries to the epidermis or outermost lawyer may heal when skin tissue rebuilds. If the injury only affected the epidermis, the resultant scarring may be mild or may completely heal. On the other hand, damage to the dermis is likely to be permanent. When the inner layer or dermis is burned healing process is much more complex because our body naturally produces a protein called collagen fibers which result in severe scars. Keloid: where the scar tissue grows beyond the original site of the injury turning red or pinkish in color. Over time this scar tissue will turn dark. Hypertrophic: are similar to Keloid in their appearance but these scars are confined to the injury site and do not overgrow. Contracture scars: a tightening of the skin which is permanent; the contracture affects the nearby muscles, tendons, and ligaments depending on the severity of the burn and scar. A contracture scar limits mobility and range of motion of the affected area. It may also cause nerve damage. After a burn injury it can take up to 1-2 years for the injury and scar to stabilize. Surgery may be required including plastic surgery to improve the mobility of the area injured by the scar and improve the scar’s appearance. If you or a loved one suffered a severe burn injury, explosion, or fire accident, contact the lawyers at Frekhtman & Associates. We can help maximize your compensation by hiring fire experts, engineers, electrical, and other safety experts. We can maximize your compensation by hiring damages experts such as plastic surgeons, top medical specialists, economists to prove lost wages, and occupational rehabilitation experts. Call us at (866) ATTY-LAW.